Merge multiple Outlook PST files into single one. Provides different merging options for user's ease. Merge only PST contacts with "Merge Only Contacts" option. Option to include and exclude deleted items. No 2 GB file limitation on Outlook PST file. Merge PST Pro allows multiple Outlook files merging within a few minutes and provides option to avoid duplicate items as it supports filter option to remove duplicate items during merging process. If you wish to merge Outlook contacts only from two or more Outlook PST files then simply choose "Merge only contacts" option in application and make a new PST file for Outlook contacts only. This is the best way to manage contacts. When you use PST Merge tool to combine Outlook PST files & archive, you can find the flexibility to either exclude or include deleted items from an PST file as it has an inbuilt option to remove deleted content. Users can give up the worry of data loss when using the PST Merge Pro. The top quality tool retains data by maintaining file structure and format. CC, BCC, To and sender's ID, all are intact during merging. MS Outlook (2013, 2010, 2007 and 2003) versions (32/64 bit). Why it is required to merge Outlook PST files? If you have lots of PST files those are scattered at multiple locations of your computer then, you may have need to merge or collect PSTs at selected location. To coup up with this problem, PST Merge software of organization is packed with full-fledged amenities. 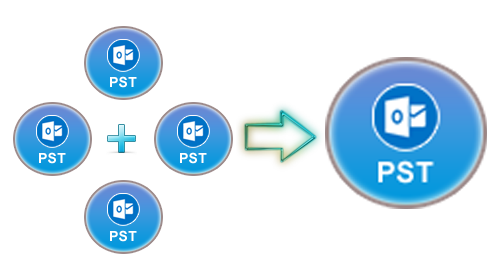 Procedure to combine multiple Outlook PST files into single is quite simple so, users do not need to work-out for learning PST combining process as well as without any extra effort bulk amount of PST files can easily gathered. Does the software remove Outlook duplicate items during PST Merge process? Yes, it gives you advanced option to remove PST duplicate items during the merging process that help you to remove unwanted/ duplicate PST items from the merged PST file. Does the software also work in case of corrupted PST files as I have 10+ PST files and some of them are corrupted/ damaged? No, the software does not allow you to merge corrupted Outlook PST files. If you have corrupted PST files, firstly you need to repair them with scanpst.exe tool (Freeware Microsoft Utility) or get some third-party Outlook PST repair software. How many Outlook PST files can be merged at a time? You can merge multiple Outlook PST files into single PST within a short period of time. It easily supports to combine two or more PST files at a time. I have many deleted items in Outlook PST files. Will this software exclude deleted items during the merging process? Yes, if you have checked the "Remove Deleted Content" option while performing the merging process, then it will surely exclude the deleted items from merged PST file. I tried many tools before this and was not satisfied with the working of these software. Then I came in contact with PST Merge software which easily handled all PST files to merge them safely. I didn't lose any of the files during the whole process. The tool is designed highly as per the user demands. I safely combined 100 PST files in one PST using PST Merge software. The software helped me in managing my PST files by speedy conversion of many PST files into one. It is a great solution for handling various small PST files. The tool is highly capable to merger all type of PST files into one. I didn't face any problem during the whole process. Thank you team, for your unbeatable efforts to make the software so smooth and entire support to the users.